Summer is here and we have already had our vacation so we are grinding it out. Logan is taking summer college classes downtown. 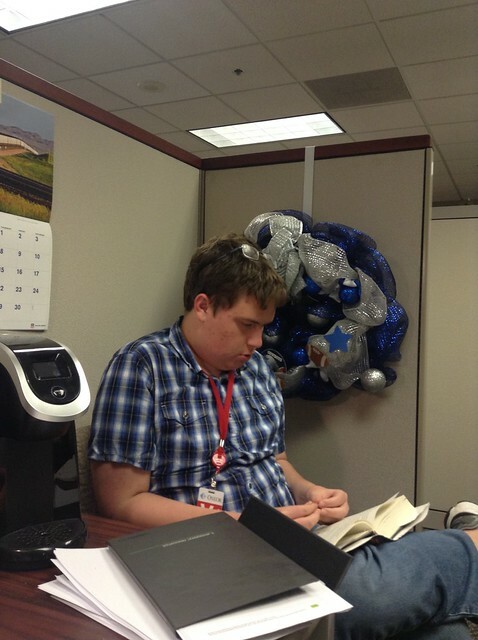 He missed his bus the other day so he got to sit in my cubicle and read. I took a class earlier this week on Leadership Training. 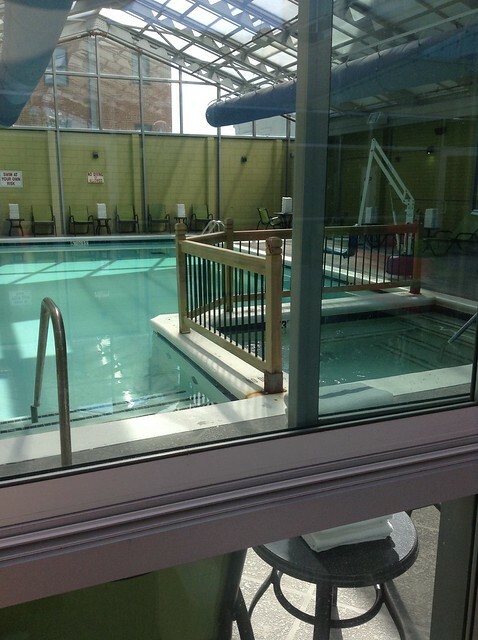 It was held at a hotel and the swimming pool was next to the meeting rooms. We should have brought our suits. Coming back from vacation in Alabama we found a decent liquor store with a knowledgeable clerk who gave me tips on all sorts of local and regional brews we don’t get in Oklahoma. This is a Key Lime Pie Gose. 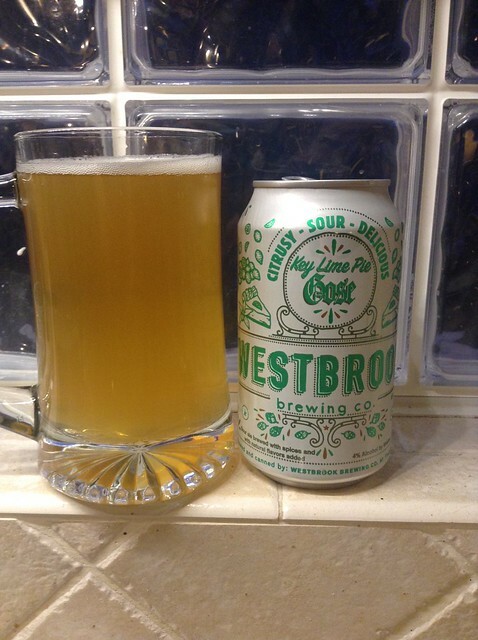 Gose beers are kind of sour and salty and they are just the thing in the summer. This one was great. 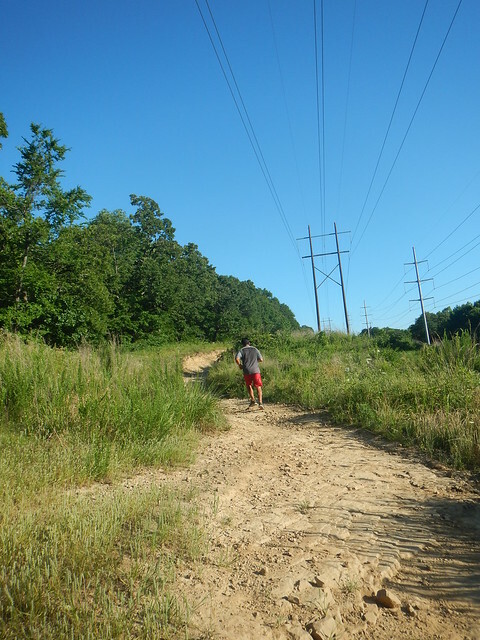 I wore my hydration pack for the first time for my weekly run on Turkey Mountain. I can carry 1.5 liters of water instead of just 750 ml that I can carry in my water bottle plus a lot easier to carry. You have to watch your balance though climbing up rock faces. Too easy to lean backwards too much. The pack doesn’t make me any faster but I can run farther and not be so wiped out at the end of the run. Logan is getting a few more weeks of job skills training at Goodwill Industries. They have a pretty decent program for kids on the Autism Spectrum. Next up they will help him find a job. And then they provide job coaching. We are grateful for the support. I won a $25 Goodwill store gift certificate at a Goodwill event just before we went on vacation. 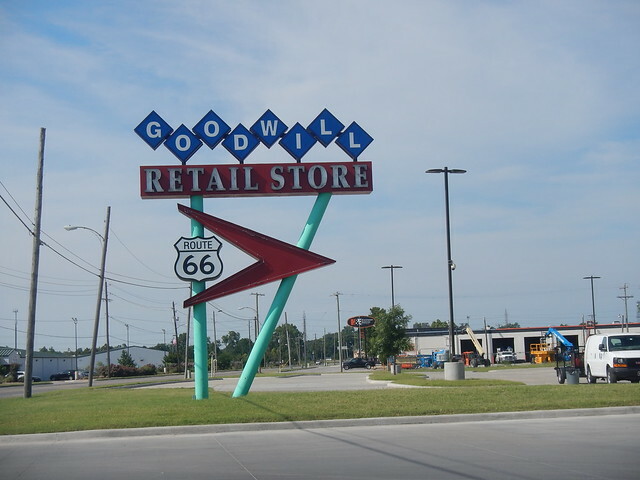 What do I buy at Goodwill? They surprised me with their collection of inexpensive books. So I got a box of books!! 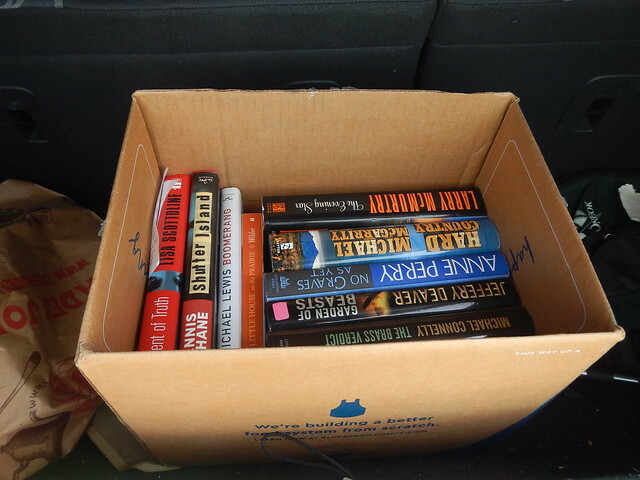 Which I will recycle through my account at used book store here in town that basically costs me a dollar when I exchange like for like quality of books. Sometimes I think I am extraordinarily cheap. Maybe but I like making a game out of it also. Visiting my sister, Ellen who has started work in Yellowstone Park as a seasonal worker for a vendor. Check the link for her blog. She is making the most of her time there. Going to see my Dad in Idaho. How about you, what do you have on your plate? Oh yes, the latest Microsoft Windows upgrade has slowed my machine down tremendously. I thought I might have to get a new one but I am trying a huge increase in RAM from Crucial dot com. I am going from 2 gb to 16 gb at pretty reasonable cost. If it works. I’ll let you know. It should be here in a couple weeks. I can’t hardly run photoshop any longer. This entry was posted in Family and tagged Logan, Summertime, Work on June 9, 2017 by Alan Bates. 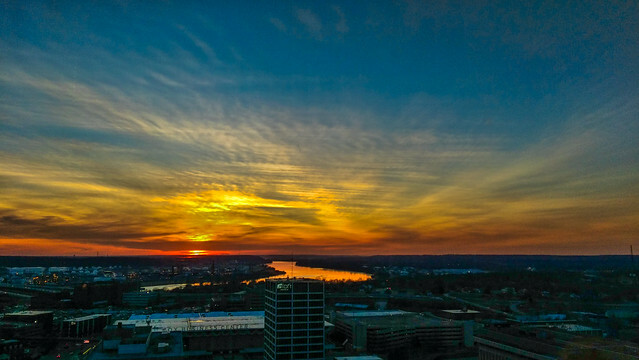 Another shot from the building I work to the west with a sunset and the Arkansas River. I am moving this week from the fifth floor at work to the sixteenth floor so I walk a few steps over to the west window to see the Arkansas River out to the west. I started out in engineering years ago and after years of hopping back and forth between the engineering, operations, and commercial roles I am back in an engineering role for the first time in a dozen years. And so I am back upstairs. I’m also getting geared up. The safety regs require safety boots while out on location. So I now have some company paid composite toe boots (lighter and more insulating than the old steel toe boots that I tossed into the Goodwill box when I last left engineering) and I ordered some FR’s (Fire resistant clothing) for use while in our facilities. 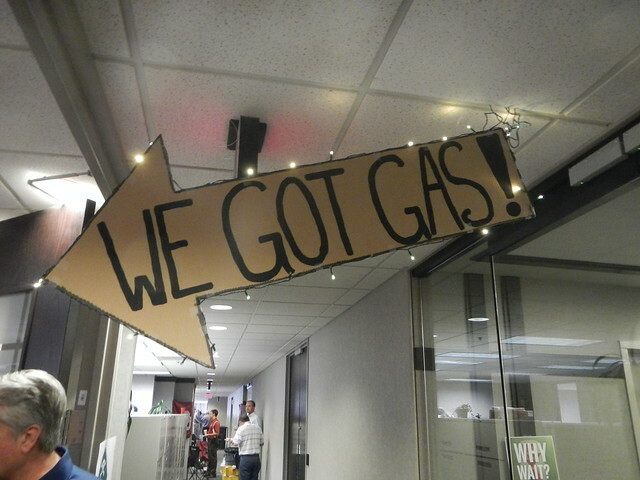 I work in the natural gas industry) My employer provides a generous allowance to buy such items. I’m okay with all things safety including wearing uncomfortable clothes. When I was in operations management way back when my worst nightmare was that one of my 55 guys got hurt. The second nightmare would be having to call their spouse, girlfriend, or parent and telling them the news. Luckily that never happened. 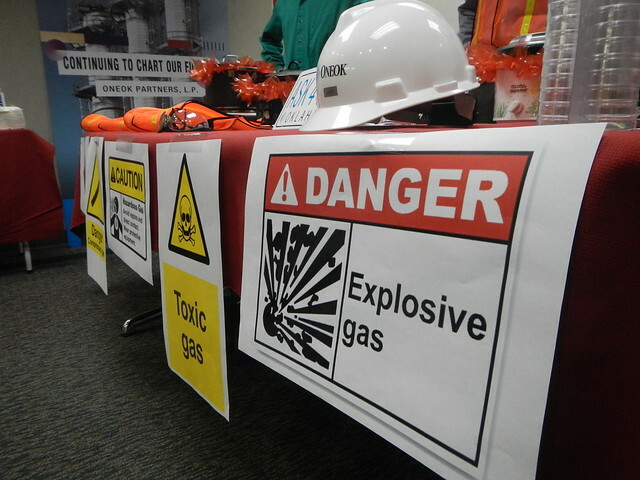 Safety for employees and the general public has gotten more serious and effective since and that is a wonderful thing. I will only be in the field occasionally. Guys and gals that work out there a lot wear hazardous gas monitors also. I visited a competitors plant a couple weeks ago and I was one of the few that didn’t have such a device. The plant manager said, okay Alan, if you see us run, I would suggest that you run also. I thought that was hilarious. So, life and works goes on!! How are things with you. This entry was posted in Skywatch Friday and tagged Arkansas River, Skywatch Friday, Sunset, Work on February 1, 2017 by Alan Bates. Saturday morning Logan and I headed out to Turkey Mountain and met up with some other people who love Turkey Mountain. Not my photo, Logan and I are are the far right. Notice my special bug proof pants I’m wearing. The local Anheuser Busch office had an employee volunteer day where about 30 to 40 their folks and spouses, and kids, and grandkids in some cases helped us repair trails and reseed some bare areas. Logan and I went with a couple down the Red Trail with shovels and rakes. Tell you what, even though it wasn’t that hot, we were all sweating in no time. It was humid. Still, even though Red is not very long we spent a couple areas working on about four or five bad spots so we did some good I think. We were all worn out. We finished a little early and I thought Logan and I could help with the reseeding but nope, I was worn out and so was Logan. The Anheuser Busch all worked very hard. They know how to have fun also. They had a trailer set up with video games. They coolers of water and I’m sure beer and were cooking up hamburgers and were playing games. We helped ourselves to some water but felt the need to get to some air conditioning and a shower. We were worn out but it was worth it. 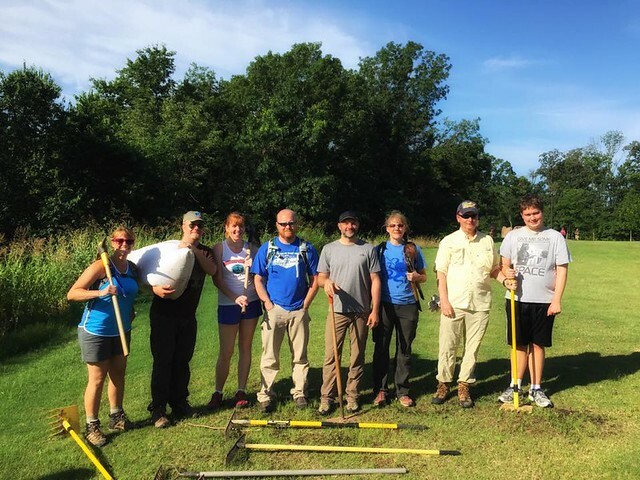 This entry was posted in Turkey Mountain Urban Wilderness Area and tagged Anheuser-Busch, Maintenance, Turkey Mountain, Volunteering, Work on June 22, 2015 by Alan Bates. 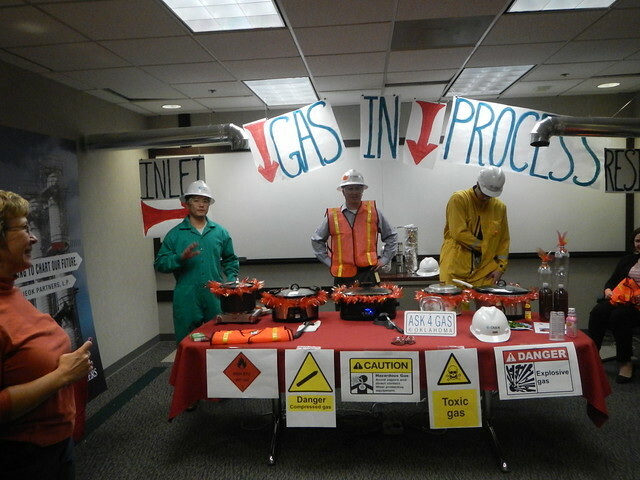 We had a chili cookoff at the gas company yesterday. It was a fund raiser and a lot of fun. 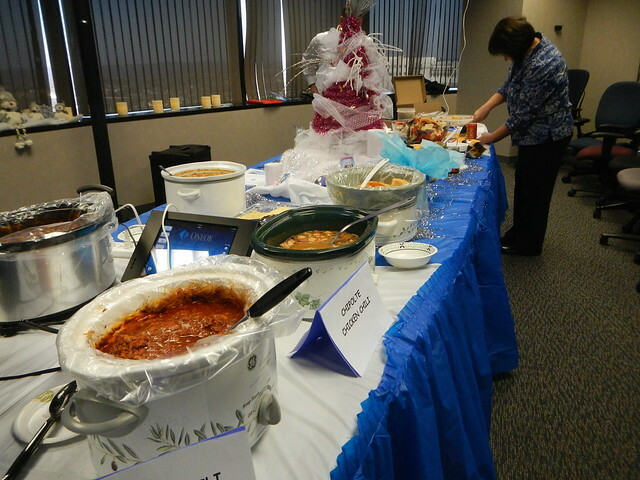 There were six different team and each team had from four to six crockpots of chili plus the fixin’s and some of them had extra stuff like tamales and such. Heather made up a batch of one of her beef chili’s and I entered that. I thought hers was the best. I told a bunch of people there that they were in strong contention for the number two spot. Here is what happens when you turn engineers loose on chili making. They may not have had the best chili but they had the best signage and were the only teams that had the correct personal protective gear. You know how you tell somebody is from New Mexico? 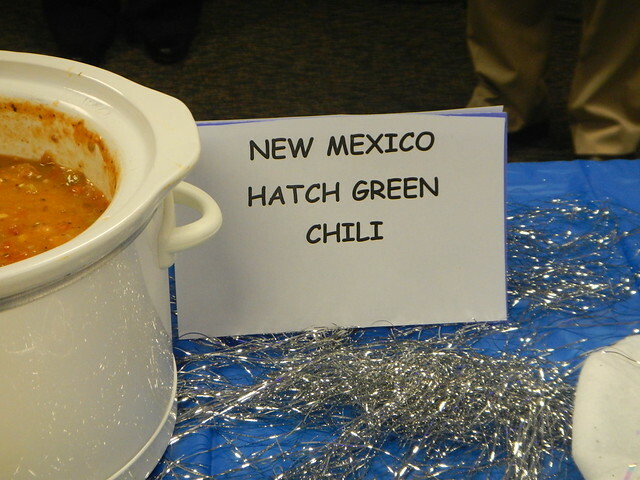 If you say “green chili” and their heart rate doesn’t bump up then they are not from New Mexico. This chili was another contender for the number two spot. I don’t really know who won but I had never eaten so much chili in my life. I love chili cookoffs. 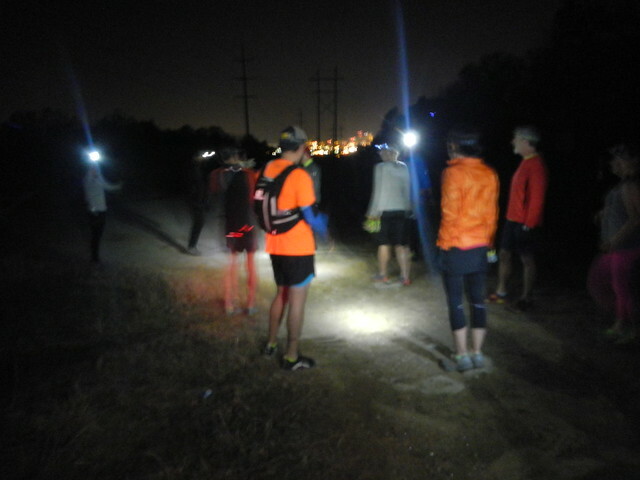 After work I burned off some calories with a night run on Turkey Mountain with a group of people. I’m getting more used to running with a headlamp. You sure have to keep your head down and focus on where your feet are going. I only stumbled once but I didn’t fall. Sometimes stumbling is worse than falling. We did four miles in the dark. It was a fast group but they would stop every now and then and let the slow guys and gals catch up. We did about four miles. I’m loving night running. 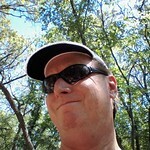 I’m thinking about planting a night geocache on Turkey Mountain. More to come on that later? This entry was posted in food, Running and tagged Food, Running, Work on December 10, 2014 by Alan Bates.